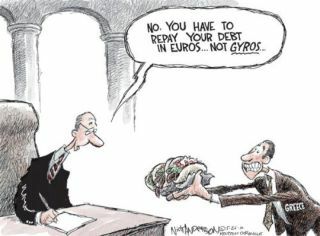 Good one,Anna!I wish they were able to repay the debt in gyros! !It would be both tasty and creative! Dzoli - Haha that is so funny! Where is your father from? Helen - Did you see this already? Boom! FOODalogue - I'd love a gyro! 500 billion gyros (gyri)? Let's start cooking. Maybe they'll take them after all. Anna, I had not seen this joke already but I often think to myself how close sounding the two words are and can easily be mispronounced by non-Greeks like my husband haha!